Olympic National Park is a land of beauty and variety. A day’s exploration can take you from breathtaking mountain vistas with meadows of wildflowers to colorful ocean tidepools. Nestled in the valleys are some of the largest remnants of ancient forests left in the country. Olympic is like many magical parks in one. Take some time to explore its different faces! Throughout the winter season, rain falls frequently in the Hoh Rain Forest, contributing to the yearly total of 140 to 170 inches (or 12 to 14 feet!) of precipitation each year. The result is a lush, green canopy of both coniferous and deciduous species. Mosses and ferns that blanket the surfaces add another dimension to the enchantment of the rainforest. The Hoh Rain Forest is located in the stretch of the Pacific Northwest rainforest which once spanned the Pacific coast from southeastern Alaska to the central coast of California. 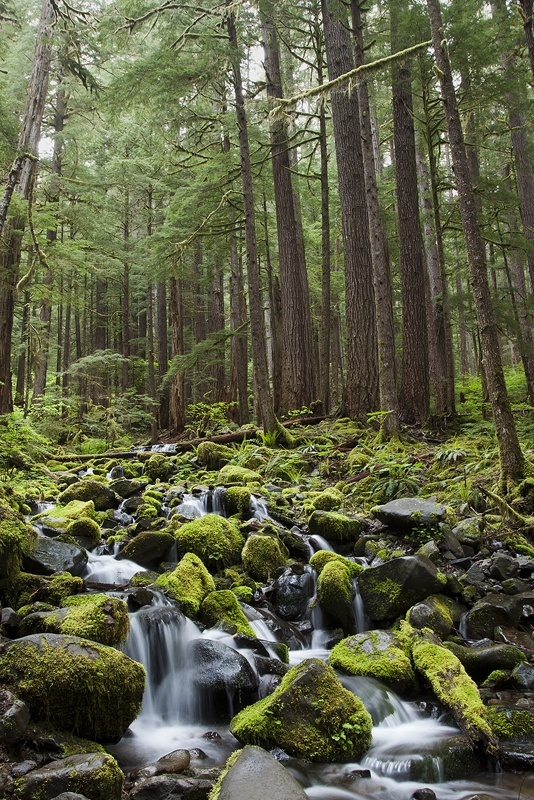 The Hoh is one of the finest remaining examples of temperate rainforest in the United States and is one of the park’s most popular destinations. Hurricane Ridge is the most easily accessed mountain area within Olympic National Park. In clear weather, fantastic views can be enjoyed throughout the year. Hurricane Ridge is located 17 miles south of Port Angeles on Hurricane Ridge Road, off Mount Angeles Road. For thousands of marine species, these coastal waters are a safe haven. The marine environment and offshore islands are protected by three national wildlife refuges and Olympic Coast National Marine Sanctuary. The refuges manage the islands visible above high tide waters for 135 miles along the coast. Large nesting colonies of birds like common murres and tufted puffins need these rocky outposts. Whether it’s the tall seastacks that dot the coast, the crystal waters of Lake Ozette, or the grandeur of the old growth forests, the landscape of Ozette is full of opportunities to explore a diverse landscape. Ozette is located on the northwestern coast of the Olympic Peninsula. This area is reached by Hoko-Ozette Road off Highway 112. Rocky beaches, giant drift logs, pounding waves and views of offshore islands known as ‘seastacks’ are features that define Rialto Beach. Just inland is the Mora area, characterized by towering trees, lush undergrowth and the omnipresent roar of the Pacific Ocean in the background. Rialto Beach is accessible by Mora Road, off of La Push Road. Rialto Beach is about 36 miles southwest of Lake Crescent, and about 75 miles from Port Angeles. Old-growth forest, subalpine lakes, and snowy peaks populate the Sol Duc landscape, while the Sol Duc River serves as a key highway for coho salmon, running through the valley and ascending to the lakes and headwaters in the surrounding mountains. The Sol Duc Valley is located in the northwest region of the park. Just 40 minutes west of Port Angeles, the Sol Duc is accessed by turning off Highway 101 onto the Sol Duc Road. Enormous trunks reach for the sky, lacy limbs stretch to the sun, grooved bark is sanctuary to tiny creatures in the vast cathedral of Douglas-firs that dominate the forests on this side of the Olympic Peninsula. Staircase is located in the southeastern corner of Olympic National Park, about a one-hour drive from Olympia, and two hours south of Port Angeles. The Quinault Valley is a wilderness gateway to alpine meadows, jeweled lakes and ice-carved peaks. For shorter visits, the valley has a scenic loop drive and short trails through temperate rain forest in both Olympic National Park and Olympic National Forest. Quinault is located in the southwestern area of the park, about a three-hour drive from Port Angeles and one hour from Forks.